> Newcastle look like an already relegated side. There is something dreadfully wrong with Newcastle United. It seems they have been toying with the drop for ages, yet two years ago they finished 10th and four years ago they were 5th. I looked at the sports sections of the “i” and the Times on Saturday then talked about Newcastle’s team with Benisaint on the way to the match. On paper, they look an OK side: sadly, on grass they look bloody awful. An early highlight occurred some 45 minutes before kick-off. The lovely Miss Benali came to award a pair of match tickets to a couple of nippers just in front of us. When she leaned forward to speak to them, I swear I heard a choir of angels singing. As kick-off approached, the clouds cleared. Newcastle wore navy kit with dayglow pink trim. They were defending the Northam end and within a minute had everybody back defending a corner won by Mane. Bertie’s cross found Virgil – his header was flicked on by Pellè but held by Darlow. Saints next attack saw Long open the scoring. The Irishman played a one-two with Pellè in the middle of the park. As he carried the ball forward, Newcastle’s midfield parted like the Red Sea. With just Taylor in his path, he dropped his shoulder, turned inside the defender and rolled the ball, left-footed, past the dive of Darlow into the far corner. 1-0. Newcastle’s first significant attack came on 6 minutes. The industrious Townsend set up a shooting chance for Perez but he was magnificently closed down by Fonte’s block. A minute later the ball was down the other end, Mané’s volley deflecting off a defender for another corner. Clasie took them from the left – this one caused panic amongst the defence before they were able to clear. There are few things football crowds like more than seeing the ref on his arse. As Newcastle carried the ball upfield, Mr Madley obliged with a graceless slip. As the game developed, Newcastle seemed desperate to get forward but lacked the ability to string passes together. Saints showed a degree more control and both full-backs were able to get down the wings. On 10 minutes, Bertie won another corner but Clasie’s cross was cleared. On 13 minutes, an under-hit back-pass by Taylor encouraged Long to chase as Darlow attempted to clear. Long appeared to get there first but the keeper took both man and ball. You’ve definitely “seen them given” (at Anfield and Old Trafford) but not to Saints. After treatment, Shane was able to continue. On 17, Martina and Pellè combined to set up Mané but the African was unable to bring the ball under control. A minute later, Perez fouled Martina and Bertie’s free-kick was headed behind by Janmaat. Clasie’s corner was too long but Virgil chased it down and won a throw in. We were almost treated to a Pellè special as he attempted a bicycle kick as Mane’s cross came in. He failed to connect. Then Long was fouled by Janmaat giving Saints another chance to get the ball into the box. As the cross sailed over, Victor was dumped on the ground by his marker but the ref was clearly looking at something else – as usual. For the second game running, both technical areas were prowled by former Valencia managers. Saints were now dominating play. On 23, Victor set Tadić away down the left. He cut inside but his ambitious shot didn’t trouble Darlow. Another Bertie free-kick was cleared by the Magpies before Mané set up Tadić. His shot was charged down. On 28, Saints produced a lovely passing move that saw Tadić feed Pellè. The big man’s half-hit shot was easily fielded by the keeper. Newcastle’s sporadic attacks were unable to unsettle Saints and Clasie was providing effective cover for his defenders. On the half-hour, Taylor headed another Bertie cross behind. This time Big Vic got on the end of Clasie’s cross but headed over. 5 minutes later Martina and Pellè worked the ball to Long. His initial cross was intercepted but the ball was recovered and a second cross was met by Pellè’s diving header which flew wide. Then Pellè set up Tadić but the Serb’s shot also missed the target. On 38 minutes, a rare foray forward by Newcastle saw Saints recover the ball deep in their half. Mané carried it towards the centre circle before sending a long pass out to Tadić. It seemed Janmaat must intercept but, as he tried to change direction, he crumpled to the ground and Tadić was away. He drove towards the box with Pellè coming short and Long in behind. Tadić chose the latter and Pellè too fell over trying to turn. Long’s control was poor and the ball ran back along the edge of the area – and Pellè rose and struck the ball past Darlow into the far corner. 2-0 Saints. Janmaat however was unable to continue. He had tweaked something and limped off to be replaced by De Jong – who went straight into the middle. Tadić then won another corner which Clasie took. Long went over under a challenge from behind but, of course, it wasn’t a penalty. After a while it seemed Sissoko was supposed to be at right back but he was often AWOL when Saints broke forward. As the half drew to a close Mané had another pot which Darlow comfortably held onto. Then Virgil surged forward before hitting a wayward shot wide. Two minutes added time passed uneventfully. Half Time: Saints 2 Newcastle 0. The Magpies came out for the second half a long time before Saints. Rafa swapped Anita to right back with Sissoko on the left and replaced Taylor with Lascelles. The young defender was quickly called on to break up an early Saints attack. On 47 minutes a poor clearance by Fraser invited Sissoko to try a long range pot at goal but he steered his shot well wide. Sissoko set up the next Newcastle attack, charging down the left before delivering a cross into the box. Mitrovic’s attempted volley completely missed the ball but Townsend, coming in behind him, forced a corner. Virgil rose to head the corner away. On 53, Long sent Tadić away and his cross hit Anita winning a corner for Saints. The ball came out to Victor who played a one-two with Fonte before curling a cross back into the box. Newcastle cleared for a throw in. Saints then won another corner and, with Newcastle dozing, a short corner enabled Mané to burst into the box. He cut the ball back for Fonte whose shot came back off Darlow. Following up, Victor blasted the rebound past the defenders: 3-0 to Saints. Townsend had another effort cleared before Mané launched an attack which saw JWP’s shot blocked for a corner. Bertie swung it in but Darlow made a simple catch. Then, on 65, Newcastle moved upfield. Townsend received the ball wide right then cut in past Clasie and curled a left foot shot round Bertie. Fraser never saw it till in bounced out of his goal: 3-1. Cisse replaced Perez whilst, in front of us, Rodriguez was warming up for the umpteenth time. On the park, Pelle sent a lovely pass through to Mané who cut in and curled a shot just wide. On 76, Romeu came on for Clasie. After several minutes camped in Newcastle’s half, Saints were suddenly pushed back. Virgil barged Townsend over giving him a free kick. The cross was met by Mbemba but sent out for a goal kick. With 10 minutes left and the clouds returning overhead, Ron finally called back J Rod. A huge roar greeted the striker’s return to 1st team action. He was soon involved and on 84 Mané tried to find him with a cross which was headed behind by Anita. JWP’s corner reached Victor whose shot was blocked. Romeu, following up, struck the rebound wide. J Rod’s next run and cross was blocked by Anita and moments later JWP tried to find him with a pass into the box which was intercepted. With 89 minutes played Saints won the ball back enabling Pellè to cross but Romeu’s diving header flew wide. In the final minute Mitrovic had the ball in the net but the linesman was flagging for offside. In the 3 added minutes, Pellè was felled giving JWP the chance to put over another cross. This time Darlow rose to punch the ball away and that was that. Final score = 3-1 Saints. 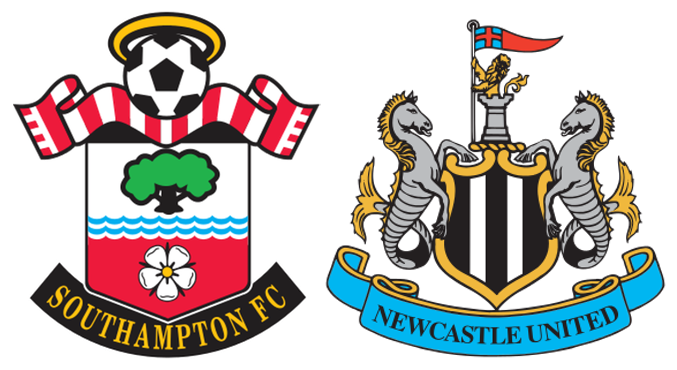 Saints had been comfortable all afternoon and might have buried Newcastle had they been more ruthless in front of goal. From the moment Long put us ahead the result was rarely in doubt and this further defeat now leaves Newcastle 6 points from safety. I called Drew from Red Funnel and he’d just heard Charlie Nicholas’ summation of the match on Sky. He had castigated Newcastle for their poor performance and reckoned Saints had been comfortable winners “without ever getting out of second gear”. Pelle – with hibernation over, he looks fired up for the summer.